I thought I'd start a thread for the historical miniatures gamers. So what have people been playing recently? How's the painting? I've been working on a few different projects, some for myself and some for clients. -Saga: Aetius & Arthur has seen several games played with the new factions. My gaming group has been enjoying the new play styles, and discovering the power and weaknesses of some of the battle boards. I've played lots of games with the Saxons (and a game versus). I've been using my Dark Ages Anglo-Saxons for the army. The Saxons are maniacs when used right. They can unleash so much damage in small units, in effect deploying little berserker mobs to tear through their opponents. I broke out my Goblin Wolf Riders to proxy in as the Huns, surprising my friend's Romans with their sudden speed. 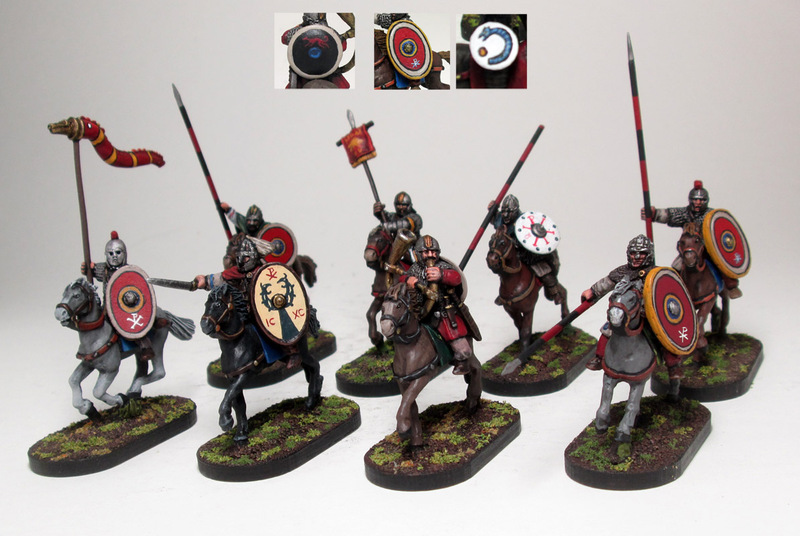 I've recently finished a unit of mounted Hearthguard for use with either Romans or Britons. Anyone else played some games? -For Field of Glory, I finished an army of Hundred Years War English in 15mm. The game was well liked years ago with my old group, but it sort of faded overnight. I've only recently been able to get some interest, with a pair of new players working on York and Lancaster forces for the War of the Roses, and another player is working on the French. -Blood & Plunder got big at my FLGS, once the Kickstarter rewards got in. One player has been very vocal with his support, running demos and getting new players into it. I painted up the French starter box and have gotten in some games. Good system with a nicely strategic unit activation/initiative system. If folks are interested I've posted my historicals as I finish them on my miniature blog. Would love to see everyone's own work. Haven't played anything in a while. On the painting side, I have some French late Napoleonic infantry and cavalry to paint, some British regulars for Bolt Action and a pair of Shermans (1 of them a Firefly), as well as a company of British paras and a small horde of Soviets for Flames of War (neither of which are likely to ever get started, since 4e killed my interest). On top of *that,* I also have a 6mm ACW project in a holding pattern. I really ought to get those Bolt Action things done, and get back to those Frenchmen. But alas, GW's return has taken all my time and energy on that front. Finished a Saga Age of the Wolf campaign before the summer. We only used Dark Age factions, and I haven't yet had a look at the new stuff from A&A. My models are about as non-historical as your Wolf Riders. I play a few and am just starting another! Currently I have Flames of War, Late War, Normandy Landings German Panzer Lehr and to oppose them am building a British Tank Squadron (still need: 17pdr variant M10s, Stuarts, 5.5inch artillery...maybe some AVREs?). For these I play 4th edition and am fairly enamoured with it - a big improvement in playability from 3rd edition without losing much (if any) of the meaningful decisions during the game. A bit salty over flamethrowers being fairly poor though - renders Churchill Crocodiles fairly lame. I also have a 2k+pts painted and ready to play 6mm Warmaster Ancients Normans army (who could fairly easily proxy in as forces spanning from about 600AD to the end of the first Crusade) and have played a few games against my friends Saxons (that are beautifully painted, he's put a lot of effort in and they look fantastic). Really good game that is again dominated by decisions during gameplay though does have some frustrations dealing with skirmisher cavalry forces (which luckily is less an issue with the forces we are using). Also the rules mechanics work across time and space so you can do ahistorical stuff with the rules working entirely fine even if it's a bit weird (Sengoku Period Samurai vs Egyptian War Chariots!). At the club some of us have just started (as in, orders placed with Baccus 6mm and waiting for delivery!) 6mm Napoleonics using the Polemos ruleset. Not played it before so we're all coming into these rules blind (which is a level playing field for everyone so hurray!) but I really want to get the group to focus on the Marechal d'Empire version of those rules to play on the really grand scale. I have a thread in Tangency asking about uniforms and flags for this project incidentally. Finally I want to convince people at the club to do 6mm Thirty Years War with the Pike and Shotte rules (an evolution of the original Warmaster by Rick Priestly). Ever since hearing Carolus Rex by Sabaton I went and did some research into what the album was about and came out the other side fascinated by the period and the changes it brought about. It's also broadly contemporary with ECW which is more popular here in the UK (for obvious reasons) so rules and models would work for that too. Has anyone got an experience playing with the Polemos rules? Speaking of less popular, I wish I could find suitable miniatures for Norwegians that didn't cost an arm and a leg, or were kitbashing. I finished painting my Flames of War Desert Rats. It was intended for v4 but my club wanted to stick with v3 so I've been playing that with the help of borrowing missing pieces from a fellow Brit player. I love my Grant models but they have performed disappointing ingame to the I'm almost wishing I hadn't bought them level. I've been playing a lot of Hail Caesar, Pike and Shotte and Black Powder at my club. I don't like those rules but they're the most popular line of rules here. I've not played it yet but I've been promised a demo game of L'art de la Guerre. Looking forward to it. I never managed to find an opponent for my By Fire and Sword Swedish so I'm planning (Well, ordered today) on starting a Polish army to go against them. I'll starting painting them once my 40k terrain is painted. I've played a little Bolt Action but it seems to be losing popularity and doesn't yet have a replacement. What is it you find you dislike about them? I have the Pike and Shotte rules (with the intention of sing them for 6mm by tweaking base sizes) but haven't played them. What has been your experience with them? I don't like the order system. It might be alright in a 1v1 but in a big multiplayer game where each player has 1 brigade a bad streak of luck can leave a player waiting a long time to get to do anything and if you got the leadership 7 general it's not that uncommon. My experience with Pike and Shotte was pretty much the same as the other rules, it's very similar to the others with the usual little changes. My group had a bit of trouble learning how the Pike and Shot units worked. I don't own the rules but the supplement books are popular with those who do.